"Please don't go to Syria--come home with us," my mother said. We were standing in Rumi's mausoleum in Turkey for the annual mystic celebration of his "Wedding Night"--when Rumi died, and finally met his "Beloved." "But if I don't go to Syria now--I may never get to go," I replied. Little did I know at the time how prescient my prediction would prove--when two months later Syria erupted into a civil war. For the past ten years, I've been wandering from Afghanistan to Mali, trying to visit as many living and dead Sufi masters -- and shrines -- as I possibly can. 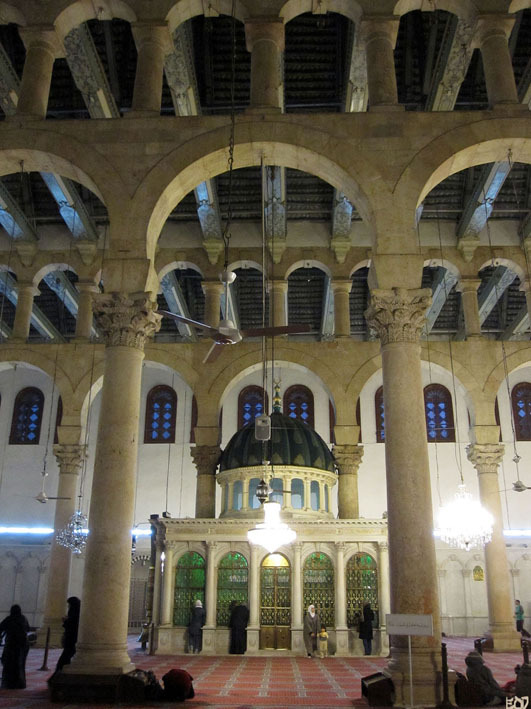 But perhaps no place excited me more than the splendid shrine of John the Baptist in the Umayyad Mosque of Syria. Cruising past the Corinthian columns lining the crowded walkway to the mosque, the archaeologist in me was tempted to stop and admire the Roman remains of the Temple of Jupiter--but I was determined to go straight to the shrine of John the Baptist (the Prophet Yahya in Islam)--since a Sufi sheikh in Turkey had instructed me to make it my first stop. As a guard at the door handed me a long grey cloak to wear before entering the complex of the mosque, he pointed to the amber glow of the setting sun lighting the eastern minaret on fire like a candle. "Do you know what that minaret is?" he said. I hadn't a clue--and wondered if it might be a test. 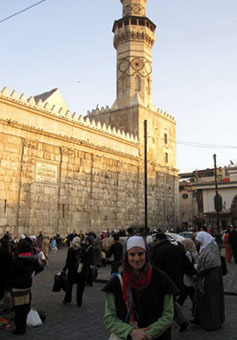 "That is the Jesus minaret--where Jesus will return at the end of the world," he said, leading me into the courtyard. 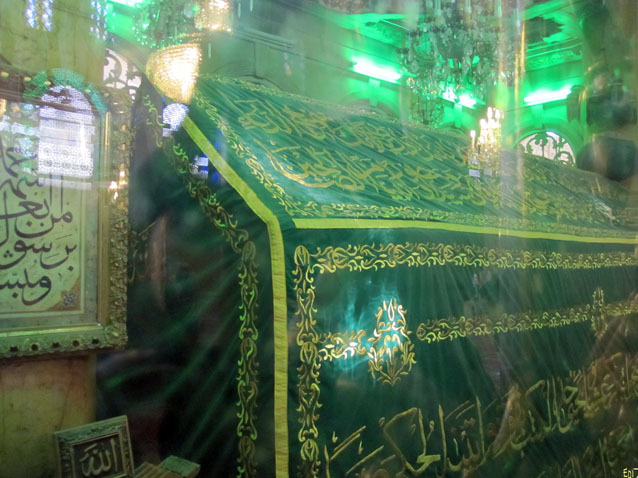 Surveying the vast palimpsest of pagan, Christian and Muslim architecture and iconography before me was like reading a hundred history books with just one blink--and I knew I would be spending the rest of the day exploring every inch--from the tomb of Saladin tomb to the shrine of Imam Hussein. As I walked to the main door of the mosque, I remembered how Pope John Paul II tread the same path in 2001 in the first papal visit to a mosque. It was fitting that he had Grand Mufti Ahmad Kuftaro--a revered Sufi master--at his side, since Sufis used to preach at the shrine, and sleep in the mosque's secluded cells--occupied previously by Christian monks. The Prophet Yahya also appears in the works of many renowned Sufis, like Ibn Arabi--the Sheikh of Sheikhs buried in Damascus. 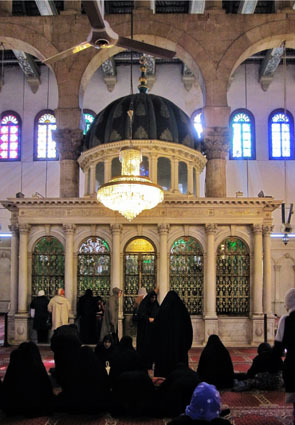 When I passed through the main door of the mosque, the green-domed shrine of John the Baptist seemed to be drowning in a dark and choppy sea--as dozens of Muslim women, draped in black from head to toe, were praying and moving along the shrine's smooth marble sides. "Where are you from?" I asked one of them in Arabic--since they seemed to be members of the same group. "Iran," she said. When I began speaking in Persian, she was so shocked that she could barely respond. As we shared our mutual excitement about having reached the shrine, I contemplated the different paths--one from the "east", and one from the "west"--which had led us to the exact same spot. When most people think of John the Baptist, they don't picture busloads of Iranian women praying at his side in Syria. And when most people say the word Iran, they don't think of the Prophet John. Just three days before, I had seen Muslims and Christians praying together side-by-side in the one room chapel of the House of Mary in Turkey. 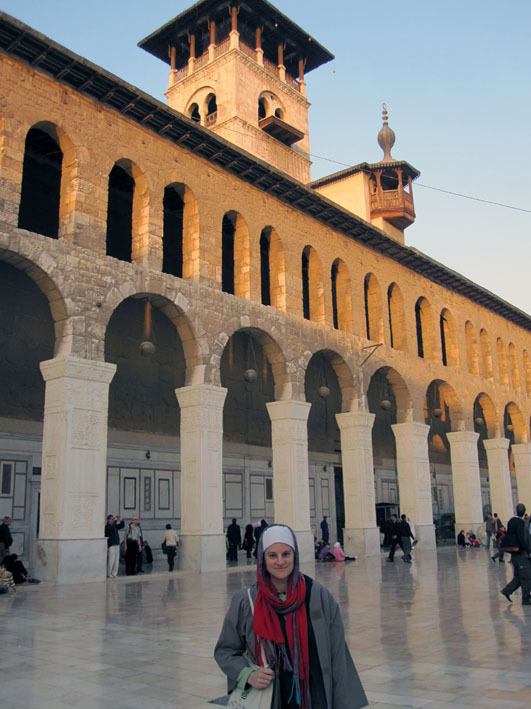 And now, an elderly Iranian woman, reclining on the rose-colored carpet, was smiling and offering me a piece of bread in front of this stunning Syrian shrine--just one of many in the Middle East to which people of different faiths journey to offer up a prayer, and leave behind despair. Similar to the account of John the Baptist in the Bible, the birth of the Prophet Yahya in the Qur'an is miraculous, since Zechariah and his wife were unable to conceive together--before Zechariah's desperate prayers for a child were answered. In Islam, the Prophet Yahya is an exemplar of righteousness, kindness and piety. Sufi commentaries emphasize his divinely-given wisdom (19:12)--which he received as a child. In the Qur'an, the Prophet Yahya is "a prophet from among the righteous" (6:85 & 3:39). Similarly, John's "righteousness" in the Bible compels him to clear a path for the light--the coming of Jesus--by walking through the wilderness, saying, "Repent, for the kingdom of heaven has come near" (Matthew 3:3). John is so righteous and bold that that he dares to challenge King Herod's unlawful behavior, and criticizes his tyrannical abuse of power. In my travels, I've heard some mystics refer to John and Jesus as the perfect representatives of the journey of the human heart--with John symbolizing the contraction of the heart when it is filled with fear of God's Majesty, and Jesus embodying the joy and relief of the heart when it expands with love through God's grace. 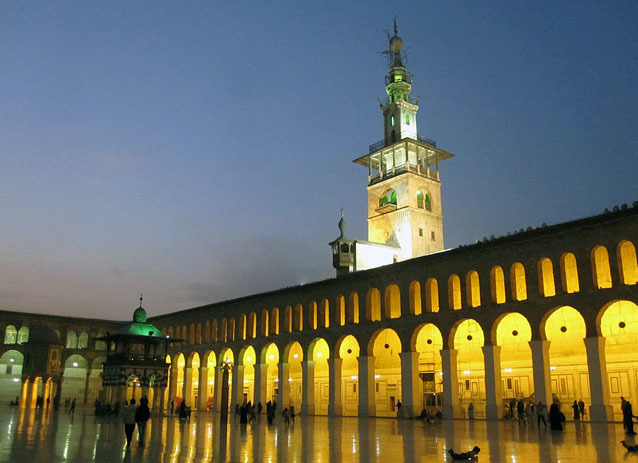 The close relationship between Jesus and John in Islam is apparent from the Prophet Muhammad's blessed miraj--his miraculous night journey through the heavens--when he found John and Jesus dwelling together in the same level of heaven. The interdependence of Jesus and John in the Bible is illustrated when Jesus comes to the Jordan River to be baptized by John, and John says, "I need to be baptized by you, and do you come to me?" Jesus replies, "Let it be so now; it is proper for us to do this to fulfill all righteousness" (Matthew 3:13-17). After Jesus is baptized, heaven opens, and "the Spirit of God" descends upon him like a dove. Between these two noble hearts, it is the communion of righteousness and love which ushers in the spirit of the divine. 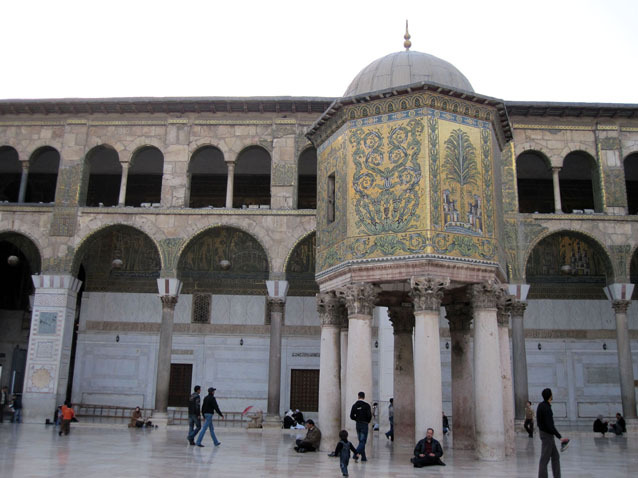 When I had finished visiting all of the shrines at the Umayyad mosque--including the one containing the head of Imam Hussein--I passed by a piece of masonry on the mosque's southern wall engraved with this Greek inscription: "Your Kingdom, O Christ, is an everlasting Kingdom, and Your dominion endures throughout all generations." 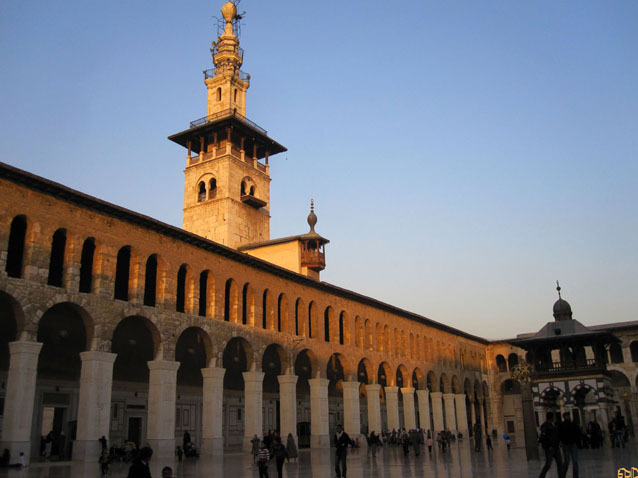 While this enduring Christian stone is just one more example of the complex and compelling overlap of different religious traditions in Syria, the beliefs and history which people of different faiths share in common is not, in my opinion, what unites them. No, what unites all of us (regardless of faith or background) is the fact that one day--maybe tomorrow, or in a 100 years--all of us, living and breathing in this precious and fleeting moment, will be gone. So why, I have to wonder, do we spend so much of our precious time, energy and resources trying to destroy one another--when everything we see will soon vanish, as though it was all just a dream? Like John in the Bible, many hearts today are crying out in the shadows of the wilderness--calling for repentance for past wrongs, and yearning to help usher in the light. Weary of war and tired of terrorism, it's easy to believe that the past decade--so barren of compassion--could never give birth to a new way of relating and understanding. But with the American public rising up with righteousness this week to say no to another war, and the President of Iran wishing the Jewish people a Happy Rosh Hashanah, perhaps a more wise and compassionate consciousness is finally being conceived. In Matthew 3:11, John says, "I baptize you with water for repentance. But after me comes one who is more powerful than I, whose sandals I am not worthy to carry. He will baptize you with the Holy Spirit and fire." The waters of repentance and the "mighty stream of righteousness"-- mentioned by Martin Luther King--are necessary to cleanse the heart, and prepare it to burn with the fire of love. And when twigs in the darkness of the forest get together and start to kindle--well, the whole forest soon burns with a light you can see from the skies. Perhaps Rumi, who spent an extended period of time in Damascus himself, put it best: "I want burning, burning--be friends with your burning." I can't think of a better time than right now to become friends with our burning--and make peace with one another.